Home » Multirotor Beginner's Guide » Efficiency Vs. Performance - How to Build a Drone with a Long Flight Time. While most drones have a flight time of between 10 to 20 minutes, it is possible to achieve much greater duration with careful planning and component selection. The video below shows a quadcopter that is capable of over 2 hours continuous flight! If you are after some clues on how to achieve such longevity, then studying its setup is a good place to start. The first tip comes from its frame configuration; it's a quadcopter. Although both a hexacopter or an octocopter have more propellers which increase payload lift capacity, it does so at the detriment of efficiency. It goes without saying that the bigger you go the more you need; motors, ESCs, batteries, cabling etc...it all adds up and equates to a diminishing power to weight ratio. Therefore, only build bigger if you actually require the extra lift or redundancy that an octocopter best offers. Furthermore, the frame configuration also dictates the maximum prop size, which incidentally ranks as one of the leading efficiency factors. Propeller efficiency is related to its surface area, such that for the same input power, a larger diameter prop provides more thrust than a smaller one. Think back to the frame configuration reference and take the quadcopter in the video as an example. It has a frame size of 120cm and swings enormous 28" props. If you were to use the same propellers on an octocopter, you would need a frame size in excess of 200cm to carry them. Thus for practical reasons alone, if you want to swing big props, a quadcopter is a better platform when it comes to the achieving the ultimate flight time. Of course electronics also play a hugely important part, particularly the motors. If you want to drive large props you need a certain sort of motor. Now brace yourself, this is where it starts to get more technical. Put simply, to spin a 15" prop requires more power (in watts) than a 10" prop, the same goes for an increase in pitch. Power is dependent on torque and RPM. RPM is essentially equivalent to the motor KV rating, more on that later. To better understand torque, lets take some analogies. When trying with all your might to open the top of a new jam jar, torque is present even if movement isn't. It's pure twisting force; it's the force that helps you accelerate quickly from a standing start in a car (for reference, it's horsepower that keeps you going). As larger/coarser props provide more resistance to movement than smaller/fine-pitched props, they require a high torque motor to be driven. Brushless motors are classified by many ratings, but most consistently by a KV value. A KV value is determined by the number of winds on the motor’s armature and strength of its magnets. The KV rating refers to the RPM constant of a motor (not to be confused with Kilo-volt) - in essence it's the number of revolutions per minute that the motor will turn when 1V is applied under no load conditions (without a prop). For example, a 12V 880KV motor will be able to achieve a theoretical maximum RPM of 10,560. In actual fact, while motors always attempt to turn at a speed of KV x volts they never actually make it because of losses. To explain how a KV value is useful, another car analogy. Like combustion engines, brushless motors come in many variations. Think of low KV motors like a diesel engine, they are low revving but produce a lot of torque (pulling power) and they are economical. On the other hand, see high KV motors like a petrol engine. They tend to rev much higher and are able to achieve higher top speeds but at the cost of efficiency. Hence, low KV motors are better suited to swinging big propellers slowly, and high KV motors small props very quickly. This is demonstrated in the quadcopter video. In order to spin its efficient 28" propellers, it employs very low 100KV motors. In contrast, you will see aerobatic multirotors with much shorter flight times using high KV motors (1000+) and relatively small props. If you tried to spin a 28” prop on a 1000KV motor, the load would be too great and the motor would just overheat which is detrimental to its life. For the next piece of advice, look at the quadcopter's ESC and battery selection to get another clue. It uses 30amp ESCs and a 6S battery. This is what we call a high voltage system. Generally speaking these are the most efficient setups. To understand why, you need to know some basic electrical theory - see those physics lessons were actually useful! Energy isn't free, to do a job be it kicking a football or spinning a prop requires a calculable amount of power. The equation tells us that power measured in watts (which is the work done in a unit of time) is a product of amps and volts. You can see the relationship between watts, amps and volts in the spec sheets that accompany motors. 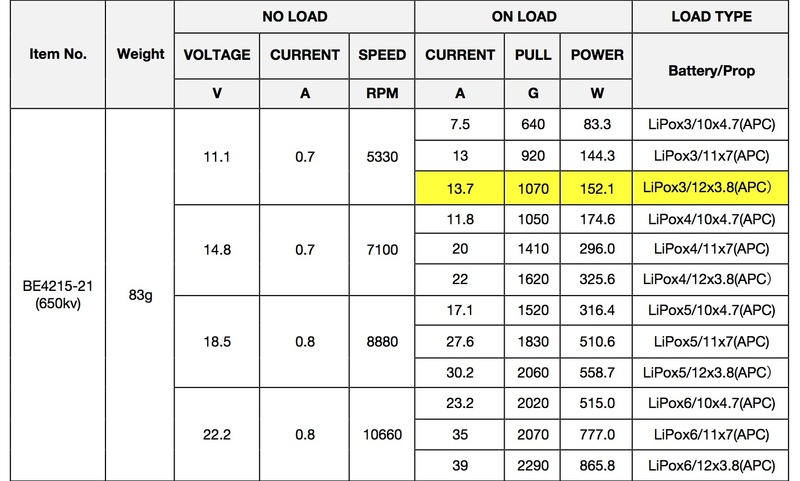 For example, see in the table below how a 650KV motor spinning a 12x3.8 prop at 11.1v (3S LiPo) draws 13.7amps, which equates to a power output of 152.1 watts. 11.1 (Voltage) X 13.7 (Load - Amps) = 152.1 watts (Power - Watts). The relationship between watts, amps and volts means that a high voltage, low amp draw system can yield the same output watts as a low volt, high amp setup. This fact is very useful to us, as your LiPo's capacity (which translates into flight time) is determined by milliampere-hours (mAHs, in other words amps! 1 mAH is 1/1000th of an amp, so 1000 mAh is the ability of the battery to deliver 1000 milli-amps for one hour. Therefore if we operate a low current drawing system, compensated for by a high voltage input, we can still meet power demands and yet prolong battery life. Furthermore if your setup's amp draw is lower, there is less of a voltage drop under load and that means higher sustained voltage during hard flying. As previously statedwe can build a low current drawing setup by using low KV, high quality motors. While sing a high cell count LiPo, for example a 6S 22.2v battery, can provide a high voltage. From reading this blog article you may have come to the conclusion that using the largest props, the lowest KV motors and highest voltage batteries give the most efficient setup, unfortunately it’s not that simple. While those general principals are true, you must take into account a thing called tuning. All engineered things are designed to run in a specific operational window – a sweet spot. To achieve good efficiency, parts need to be carefully selected to suit the intended operation, while they should also be matched so they work in tune. To take the car analogy, you can put a sports exhaust on a car, but if it isn’t matched with other components it won’t necessarily go any faster. The same is true when it comes to building a drone. While higher voltage setups are more efficient in principal, they are typically heavier due to bigger batteries and motors. You can’t keep going bigger in search of efficiency gains as there comes a point, beyond which the weight penalty results in decreasing returns. Likewise, it’s no good just adding a bigger prop in the hope of achieving efficiency gains; by just increasing the size of the prop you will actually draw more current and decrease flight time. Components need to be matched and selected to meet the criteria set out by the operational requirements of the drone, i.e. what’s the purpose of the drone, to carry a camera payload or something else? In order to avoid selecting the wrong parts, the first question to ask is how much thrust will be required to keep the drone in the air. This is a bit of a chicken and egg question as obviously the parts selected will add up to the weight of the multirotor. However, if you have a frame in mind and know your payload it’s possible to make an educated guess by taking average values for the motors, batteries and so on. The basic rule of thumb with multirotors is that your motors should be capable of producing twice the total flying weight of your craft in thrust. This ‘safety margin’ ensures that your motors will be capable of responding quickly to your control inputs, or arresting a rapid vertical descent, even when your battery voltage is reduced over time. When you have calculated the ‘thrust required figure’ you can then divide that between your motors; by four for a quadcopter, by six for a hexacopter and so on. An average quadcopter weighs 1.5kg, so going by the basic rule the thrust required is 3kg, or 750 grams per motor. From there you can start selecting components around that figure. Most people start by choosing a motor and then scale the voltage and propeller size to match. Generally speaking lightweight performance quadcopters employed >900kv motors, while light payload carrying quads and hexas use 900-500kv motors, finally heavy lifting hexa and octocopters use <500kv motors. The goal in terms of efficiency is to design a setup where the multirotor hovers slightly below the RPM efficiency peak of the motor. This is easier said than done, as data on motors from manufacturers is usually lacking or unreliable. To this end computer modeling tools like eCalc can be useful to simulate different configurations, but the only way to be sure is to actually test different motor and propeller combinations. It’s also important to consider the quality of your components. Inferior props will flex and loose performance, while cheaper motors often use low quality bearings. Motors typically have an efficiency rating. The higher the efficiency of the motor the more power it can produce before it overheats. An 85% efficient motor produces 85% power and ~15% heat, hence if your electrical input is 180 watts, your theoretical maximum mechanical output is 153 watts. You shouldn’t only think about tuning for efficiency, but also for your application. Do you want a high performance agile drone, or one that is super stable and more suited to aerial photography? For instance, although increasing the size of the frame to spin bigger props has efficiency gains, it also increases the craft’s moment of inertia. While this makes for a more stable platform in the sense that it would require a stronger outside force to change its attitude, it also means that the motors will have to work harder to change the aircraft's position. Hence, go too big and the drone will actually become intrinsically unstable, especially in gusty weather. Finally there are the practicalities and cost penalties to consider that go with building a big prop, low KV, high voltage setup. To spin big props obviously requires a bigger, more cumbersome frame, but also a stronger one. Naturally larger/stronger frames are more expensive. The same is true of larger props and low KV motors. The additional costs also extend to peripheral accessories. Higher voltage batteries require more powerful and costly charges and so on. For these reasons alone, most amateurs run 3S (12.6 volt) setups. Unlike the pro’s that need to carry heavy payloads, SLR cameras etc., most amateurs require a drone to carry nothing heavier than a GoPro and gimbal. For these lighter payloads an efficient setup can be built by careful component selection around 3-4S (12.6-16.8v). You can probably now appreciate that there are no hard and fast rules to follow to get long flight times. Ultimately it comes down to careful planning guided by the general principals, modeling with tools like ecalc and finally trial and error type experimentation using a power analyser. The only rule that applies unanimously is that less weight* equals longer flight times, especially in non-hover situations. *Frame weight, not AUW (All-Up-Weight - includes batteries). You can use greater capacity, heavier batteries to extend flight time up to a point, beyond which the power to weight ratio diminishes and consequentially flight time shortens. well that's my brain melted! Trying to work out how I can fly longer is a hard thing to get my head around. I just wish i could get over 5 minutes on my hex. I get about 15mins with my stock hexa F550 with Naza lite upgrade to v2 it's fully loaded with a Multistar 4s battery 6600mha ,fpv gear,Fatshark cam,Aeroxcraft landing gear,gimbal with Gopro,Naza Pmu,Naza Mini Iosd,Naza bluetooth module and Flytrex core v2 flight logger. its not about mAh. almost all ESCs are mosfet driven. they have drain to source resistance. and it depends on current and not voltage. so if you could increase voltage and reduce current for sam power, net losses are lower. this brings in efficiency. By going up in voltage, you free the energy up to be used for work. It's the electrical equivalent of leverage. By stepping up the voltage, you are in essence switching gears. mAh is equivalent to the size of a gas tank. It has little to do with efficency, but rather is ability to feed a system, be it efficient or not. Because high voltage is more efficient, you see high voltage used wherever possible when efficiency is critical, such as transmission lines, air conditioners, and high demand equipment. House voltage is as high as it can be while remaining safe. You wouldn't want to run your fridge on 12V. Even if you had the amps to do it. Thank you for article, it has put quite a bit of doubt away and confirmed a lot That I have heard before. Insha Allah clearer path forward. I never knew 28" props existed. One of the key factors seems to be the matching of the components and as I understand for all this, (a vehicle analogy) we cannot build a tractor and one day convert it to a sports car. If we build a multirotor for a certain purpose, modifying it around those specs if fine but too far of and it will be useless. Thank you buddy. This article has spawned a new idea for me. I think I will try taking four of the arms off of my Tarot 1050 and testing it as a configuration. The craft is only an x8 for the sake of redundancy, as it will fly over/near roadways and other infrastructure. I would love to be able to have a convertible craft capable of both long flights and heavy lifts. My only real concern regards propellers - I don't know that the 235kv motors currently onboard will have what it takes to spin the massive props required. Hello - is amp draw calculated by adding the amp draw of each motor - e.g. in a Hex - if Amp draw is 8.9 at a given percentage - is actualy Amp draw of the craft 8.9 or 8.9 x 6 = 53.4 - big difference! Correct, it would be the total of each motor, so 53.4A for your example.